iPhone design: Documents from the Samsung trial reveal more than ever about Apple’s secretive design process. New documents reveal how Apple really invented the iPhone. The company decided to abandon the click-wheel idea and try to build a multitouch phone. Jobs knew it was a risk—could Apple get typing to work on a touchscreen?—but the payoff could be huge: If the phone’s only interface was a touchscreen, it would be endlessly flexible—you could use it not just for talking and music but for anything else, including lots of third-party applications. In other words, a touchscreen phone wouldn’t be a phone but “really a computer in your pocket in some ways,” as Forstall said in court. The iPhone team broke down into two separate but closely integrated groups—the guys who were doing the hardware and the guys who were doing the software. (I can’t find any evidence that there were any women working on the phone.) The software team’s main job was figuring out a way to make a completely novel interface feel intuitive and natural. One way they did this was by creating finger “gestures” that allowed you to get around the phone very quickly. Some of these, like pinch-to-zoom, had been used in multitouch projects in the past (you can see some in Minority Report) but others were Apple’s fresh ideas. 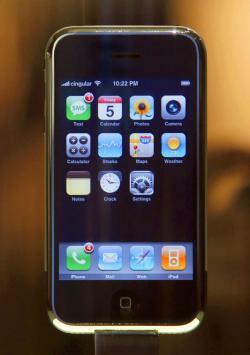 For instance, Forstall used a prototype iPhone as one of his main computers, and as he used it, he found that constantly pinching to zoom in on the screen became tedious. In a flash, he thought, why not have the phone figure out how to zoom with a just a double-tap on the screen? This was a difficult gesture to implement—the phone had to “understand the structure” of the document it was zooming in on, he explained—but once engineers got tap-to-zoom to work, Forstall found the phone to be much easier to use. “It allowed me to browse the Web much more fluently,” he said. The hardware team, meanwhile, was trying to figure out what the phone would look like. In court, Christopher Stringer, one of the Apple’s veteran designers, explained that the company created the phone through a process of rigorous refinement. A group of about 15 designers would regularly assemble around a kitchen table set up in Apple’s design studio to review, in painfully fine detail, every idea for various parts of the iPhone’s design. Apple has an extensive array of systems to quickly create physical prototypes of digital designs, and the team would handle all of these prototypes and remark on how they felt. “We’re a pretty maniacal group of people,” Stringer explained, pointing out that they would sometimes review 50 different refinements of a single hardware button. By the spring of 2006, about a year before the iPhone’s release, Ive and his team had settled on a design for the iPhone. Their winning prototype looked similar to Apple’s 2004-era iPod Mini—it was a metallic device with rounded sides, what designers referred to as “extruded” aluminum. You can see it in a 2006 photo unveiled in the trial—it’s the one left. Two iPhone prototypes revealed during the Samsung trial. On the left is a version that was scrapped just months before the phone’s release. The phone on the right is another prototype, one that looks a lot more like the iPhone that Steve Jobs unveiled in January of 2007. Indeed, the phone on the right seems almost identical to the iPhone 4, which Apple launched in 2010. What happened? Why did Apple go from building the phone on the left to a version of the one on the right? There was a bigger problem with the extruded-metal phone: One morning Jobs came into the office and declared that he just didn’t love it. As Isaacson describes it, Jobs realized that the design squeezed the phone’s glass display into an aluminum frame—but because the display was the iPhone’s only interface, the design had to put the screen on center stage. Ive realized instantly that Jobs was right. “I remember feeling absolutely embarrassed that he had to make the observation,” he told Isaacson. So, around the spring of 2006, a few months before the iPhone’s public debut, the team decided to start all over with something new. Looking through their old designs, they found a prototype they’d sketched a year earlier. This phone was a plain rectangle with rounded corners, a single button on its face, and a glass panel that covered the entire face of the phone. This was the iconic design that would become the iPhone.